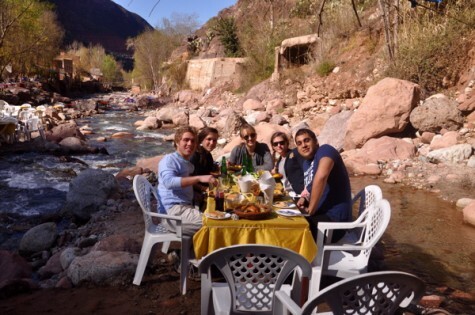 Last February, four friends and I jetted off to Morocco for a week of eating and exploration. We started our journey in Marrakech. Our first day there we wandered for hours through the souks, men calling “Snooki” and “Hannah Montana” as we passed, despite our consciously conservative dress. We putzed around and poked into little shops that sold intricate silver teapots, shops offering harem pants in a rainbow of colors, shops trying to convince you that a wooden puzzle box would be perfect on your coffee table. But we all know which were my favorite shops and stands. The ones that sold food, of course. There were small stands in the square outside of the marketplace lined up, ready to squeeze ripe, local oranges into a glass before your eyes. I’m not sure I can ever drink orange juice again after having it in Morocco. It is unbelievably sweet and really tastes of orange. Beside the juice stands were quite a few stands selling myriad dried fruits from apricots to dates (my particular favorites) and every type of nut you could imagine. 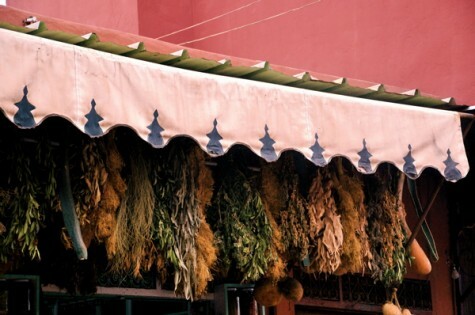 A short wandering into the main souk revealed shops tucked away behind leather bag kiosks full to the brim with spices. I managed to pick up 5 grams of saffron for 20 dirham, which is about $2.43, an incredible deal. At night, the souk became a massive string of restaurants, all competing for your business, all selling marvelously aromatic food. Meandering through them trying to decide where to eat made me wild with hunger. 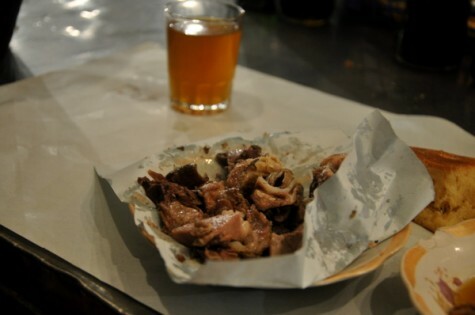 I couldn’t wait any longer, so my friend Ellie and I finally plopped down at a stand selling sheep’s head, while our more traditional eater friends sat at the booth next to us for a dinner of brochettes and calamari. Bits of the sheep’s head were quite unnerving, to be honest. Some looked fuzzy, and some were way too slimy to even attempt to eat. The brain was surprisingly delicious. In fact, it tasted mildly gamey and had the texture of soft roe. It was smooth and rich, almost too rich, and it tasted faintly of lamb. The udders were my favorite part. They were a little tough, as expected, but were so flavorful and delicious. Our next foray into strange foods was the snail stew, called Mustapha. It was probably the least strange thing we ate, but it will definitely be the last I try again. Argan oil, from a tree that’s only in Morocco, was everywhere. 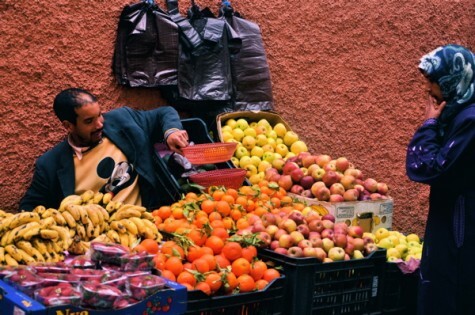 On our trip into the Atlas mountains to visit the cascades, we stopped at a pharmacy of sorts where the owners transformed oil into everything from face masks to perfume to lipstick. Obviously, I was more interested in the culinary uses for argan oil, so I had to wait until we arrived in a little Berber village before I got to taste it fresh. As we traipsed up and down the narrow dirt road, a tiny man waved us inside. He poured a steady stream of sweet mint tea into miniature silver cups covered with intricate designs. He spoke no English, and we spoke no Arabic, but we managed to communicate through smiles and gestures. He handed each of us a large khobz (Moroccan flatbread) and set a deep bowl filled with a mixture of almond butter, argan oil, and honey in front of us. It was so sweet and so addictive that not only did we finish the bowl, we bought two more containers to take with us. We ate more tagines than I could count. Most were made with lamb and vegetables and were heady with cumin and paprika and boldly wore the golden hue of turmeric. 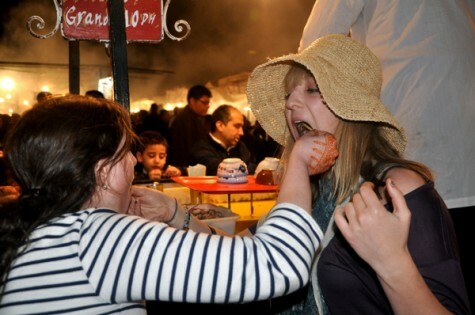 We ate them on rooftop restaurants, we ate them at cafes in the souk, we even ate them in the middle of a river. As ubiquitous as the tagines were, the mint tea was even more popular. If you’ve never had it before, you truly must. It is ridiculously strong and very, very sweet. 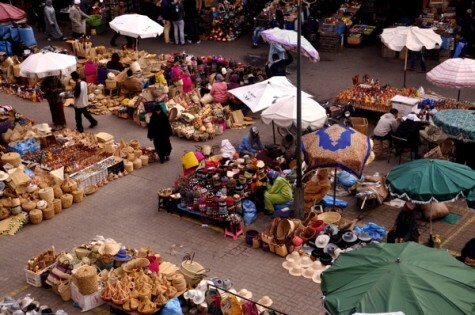 In my opinion, Morocco is the place to be and definitely the place to eat well. If you can’t make it over, at least head out to your nearest Moroccan restaurant. Big Girls, Small Kitchen has a bunch of Moroccan dishes, so you can whip something up at home!